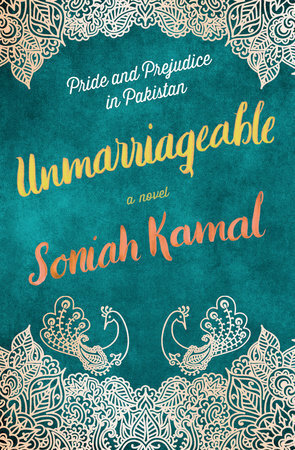 As a fan of all things Pride & Prejudice, I was very excited to read Unmarriageable, pitched as Pride & Prejudice set in Pakistan. Unmarriageable was a lovely and nostalgic read. Almost immediately, we are introduced to the Binats and their family history. I have to say, that to me, they were the highlight of this book. They were such an amusing and complex family with varying personalities. Soniah Kamal does a beautiful job at recapturing the Bennetts from Jane Austen's book but also making them her own with the desi flare to their personalities. Our Elizabeth here is a woman named Alys Binat. She is a teacher at a school trying to push her students into thinking more about themselves and less about what society wants expects from them. She is a fiercely independent and feminist character whose ideals very much resonated with me. Through Alys' eyes, Kamal does a wonderful job of providing subtle social commentary on topics such as social class and the woman's role in a home, which are rampant issues in many brown cultures. Additionally, she brought Pakistan and Pakistani culture to life. There was something extraordinarily warm about Kamal's writing and it certainly showed in the descriptions of the extravagant marriages, the mouth-watering food, and the traditions. I had a hard time putting down the book for the very reason. I'm sure you're also wondering what I thought of the Darcy character, Darsee. He remained true to the original Austen character and was an interesting individual. It was sometimes tough to gauge what he was thinking, but that only made him all the more appealing. I do like a little mystery when it comes to love interests in books. Speaking of love interests, I didn't particularly find the relationship between Alys and Darsee to be mind-blowing, but it's because I felt like they were not the focus of the story. This was very much Alys' book and I personally don't think that enough time was devoted to fleshing out their budding romance. If I were to classify Unmarriageable it would have to be as a women's fiction as opposed to pure contemporary romance. If you're a fan of Pride & Prejudice and are eager to learn a little bit about a gorgeous culture, I urge you to give this a try. What are some of your favorite Pride & Prejudice retellings?